Based on this video, it appears as if this Chromebook from Samsung would be a great machine with GNU/Linux installed on it. When watching this video, imagine how nice this Chromebook would be with a full Linux install. The very thought buoys my spirits. Perhaps the installed Linux would be GalliumOS, a Linux based on Xubuntu, but optimized for Chromebooks. Even the earliest forms of GalliumOS worked beautifully well. See my tour of an early version of GalliumOS in this video. 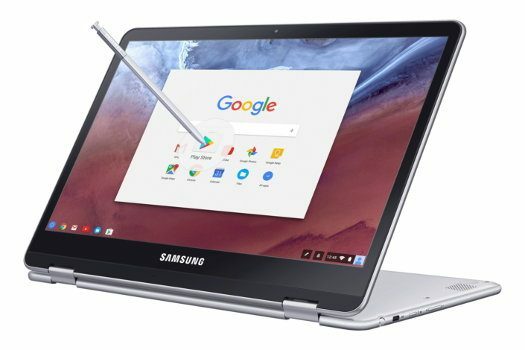 To my mind, a Samsung Chromebook Plus, with GalliumOS installed, is a far more desirable laptop than a MacBook Air. And it costs less than half the price. I’m tempted to buy a Samsung Chromebook Plus to show people who visit the public library where I work. Let them know about all of their of options. Isn’t the purpose of public libraries to help people better understand all the options in their life? That the reason I show up for work at my public library job — to help people better understand their options — maximizing their dignity and life opportunities in the process. I second the idea to show it to the public in the library, spread the word. Not a good idea to buy any ARM based machine with the expectation of running GalliumOS Linux. I’ve got an Acer C720 running GalliumOS and I’m very happy with it. I’d caution anyone who wants working graphics acceleration against buying anything with an Exynos chip in it, though. Thad, does your Acer C720 have an Intel Haswell processor? If one could replace ChromeOS with a proper Linux OS, yeah, it would be great. But until someone works out how to do it… Dream on. @Michael: Yes, it’s a Haswell. It’s the 4GB model from 2013. No touchscreen. Comes with a 16GB SSD, but I’ve upgraded it to 128. It’s not hard to open; they put one of the screws under a sticker that claims that unauthorized opening voids the warranty (this is not true under US law, but you may have trouble convincing a hardware vendor of that), and there are the usual plastic tabs that you have to carefully open to get the bottom off the case, but it’s straightforward. @tracyanne: Huh? RTFA. You CAN replace ChromeOS with GNU/Linux; there’s an Ubuntu derivative called GalliumOS that’s designed for that exact purpose. This is explained in the third sentence of the article, and then expanded on in the fourth, fifth, and sixth, plus the second video. Did you just read the lede and then scroll down to the comments? @Thad, when you “replace” ChromeOS with CalliunOS, do you have to place the Computer in Developer Mode, and remember to press a certain key combination every time you boot the machine? @tracyanne: IIRC getting the machine to default to booting from SeaBIOS requires opening it up and moving a jumper. I also understand that most ChromeOS devices are compatible with Libreboot, but I haven’t tried it myself. So, there you have it, the reason I won’t recommend it to people, it isn’t a simple install, like it is with normal PCs and Laptops, after all. @tracyanne: That’s fair enough, but it’s a far cry from your initial “until someone works out how to do it… Dream on.” response. I wouldn’t recommend the C720 as a GNU/Linux box to anybody who’s not comfortable opening it up anyway, because 16GB storage is just too tight, even for a relatively lightweight distro like Xubuntu/GalliumOS. (It’s got an SD card slot, which helps, but replacing the root drive is a better solution.) There are Chromebooks that come with more storage out of the box, though. I’m sure you could run Puppy or one of the other ultra-lightweight distros on it, but I’m not sure how good the hardware support is out of the box. The nice thing about GalliumOS is it’s got all the drivers and configurations already taken care of. Before Gallium, there was a lot of hunting down backported kernel modules and manually editing conf files.